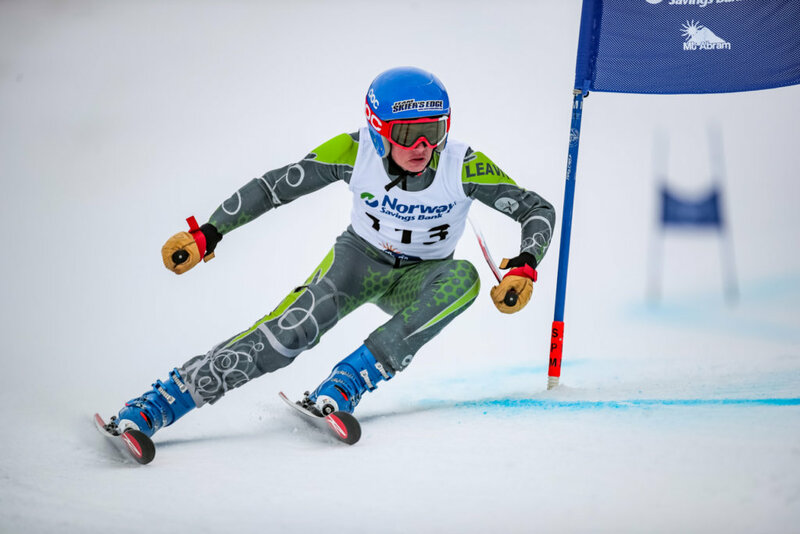 GREENWOOD — Edward Little’s Connor Jackson still had a look of disbelief on his face after he won the giant slalom portion of the Class A boys’ Alpine championships at Mt. Abram on Friday afternoon. “It feels really good,” said Jackson, a senior who didn’t think a first-place finish was possible. “I did not. We have a lot of good skiers, especially, like, Maxs Bell. “Connor Jackson — rock star coming through with a first,” Edward Little coach Jodd Bowles said with a wide grin. “The boys did what they did. We had some unfortunate things, and it happens, but we are in the hunt. The second run of the giant slalom featured a few frustrating spills, chills and heroics. Falmouth High School is sitting pretty for the moment after placing four skiers in the top-10 — AJ Noyes (fourth, 1:37.74), Nick Shapiro (fifth, 1:41.35), Ben Adey (sixth, 1:42.06) and Ben Keller (eighth, 1:43.16). Marshwood’s Sean Maguire (1:37.56) took second, Leavitt’s Brady Hathorne (1:42.73) grabbed seventh and Mt. Blue’s Eli Yeaton (1:43.31) and Greeley’s Alex Richard tied for ninth place with a time of 1:43.31. “Second run was a lot better because I worked a lot harder at the top than the bottom and let it run,” Yeaton said. Mt. Blue coach Mark Cyr also said his boys team took a cautious approach to the course. “Making rounder turns than they needed to,” Cyr said. “They should have been going in a little more direct. We tried to get them to be a little cautious on the head wall, but then let them go, but I think they improved in the second run. Falmouth seized the lead after the first day. Bell displayed fortitude after taking a small spill. But he collected himself and finished the course. He turned in a blistering first run with a time of :47.03 before his mishap that placed in 26th place. Mt. Blue’s Sam Smith found himself in a similar situation when his ski came off during the second run. “I didn’t fall or anything. My ski just came off,” Smith said. “It is pretty upsetting. I had a good run going. “That’s racing. There is nothing you can do about that,” Cyr said. But what was really impressive is that Smith also competed — and helped Mt. 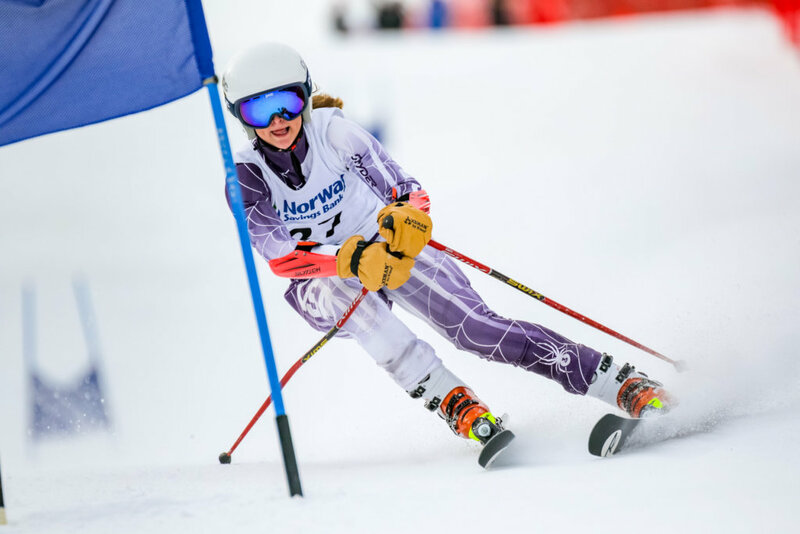 Blue win a state title — in the Class A Nordic championships in the morning at Black Mountain in Rumford and rushed back to compete in the Alpine competition in the afternoon. Mt. Blue’s Hunter Bolduc (17th, 1:46.39) said the team took a conservative approach to the Mt. Abram course. Oxford Hills’ Cameron Bancroft (24th, 1:49.36) said he took it to the limit his second run. “It went well,” Bancroft said. “I kind of played it safe the first run. The second run I took a little more risk and it almost cost me the race because I almost wiped out at the top, so I dialed it back a little bit. Cheverus’s Annesley Black finished on top with a combined winning time of 1:46.94, and Fryeburg Academy’s Brooke Juneau (1:47.69) glided into second place. Mt. Blue’s Marielle Pelletier (1:53.45) claimed third and Edward Little’s Jordan Cummings (1:54.82) finished fourth. “The girls skied a little slow — especially the first run,” Cyr said. “A little tentative, a little cautious, so they got behind the eight ball a little bit. 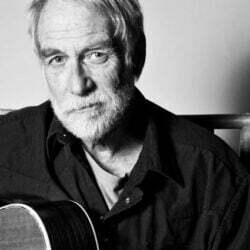 Fryeburg sits in firs place, two points ahead of Edward Little. Despite taking a fall, Oxford Hills’ Caroline Burns still finished in 21st place with a time of 2:04.50. Edward Little’s Evelyn Bilodeau (17th, 2:01.31) said was the course was a challenge. Mt. Blue’s Ashley Wiles (29th, 2:08.08) let loose her second run after taking cautious approach on the first run. 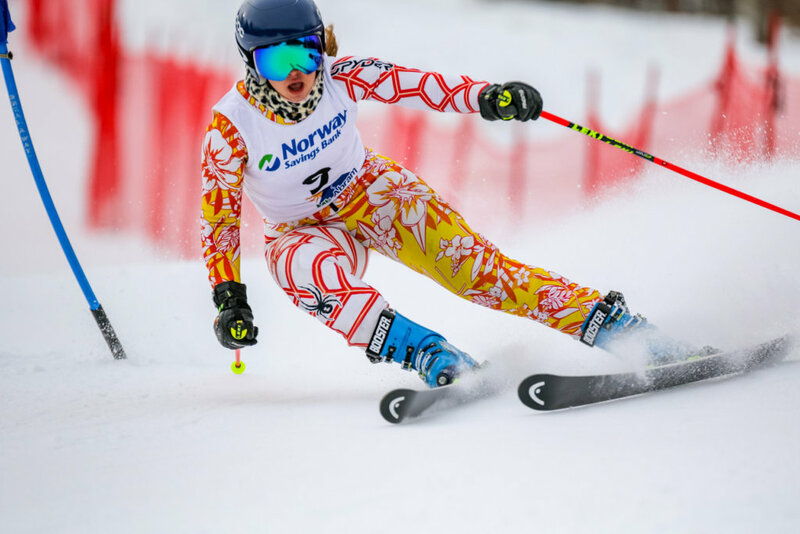 The teams return to competiton on Day 2 of the Class A boys’ and girls’ Alpine championships, which will be held at Black Mountain in Rumford on Friday. Mt. 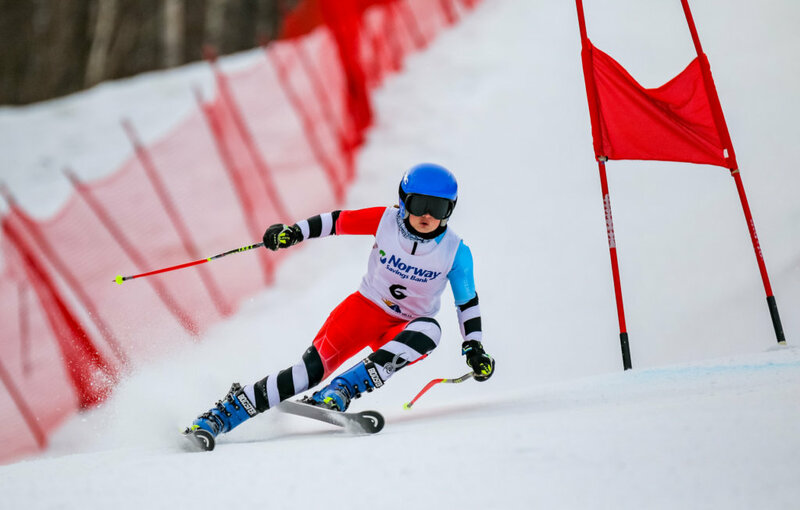 Blue’s Ellie Pelletier makes a left-footed turn on the lower part of the giant slalom course during her second run at the Class A Alpine championships at Mt. Abram in Greenwood. Pelletier finished third in the event. Leavitt’s Brady Hathorne rounds a gate at the bottom of the course at the Class A Alpine championships at Mt. Abram in Greenwood. Hathorne finished seventh overall. 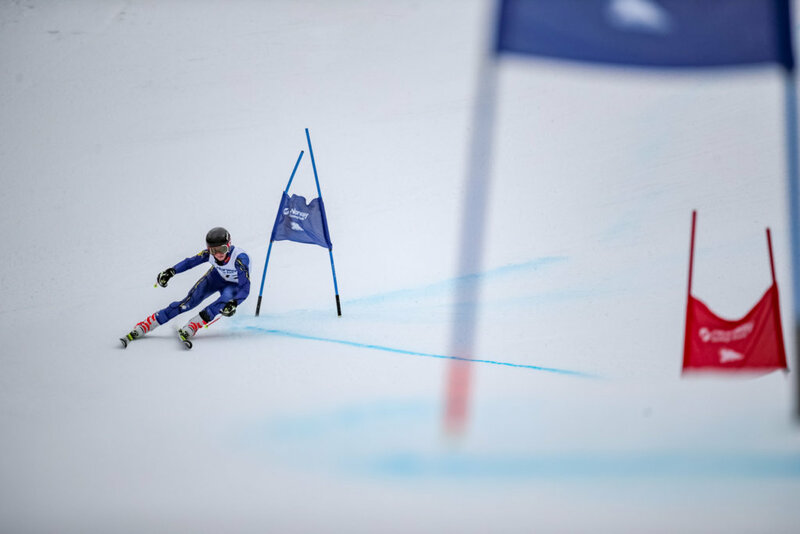 Falmouth’s Ben Adey carves a right-footed turn on the final gates of the second run in the giant slalom at the Class A Alpine championships at Mt. Abram in Greenwood. Adey finished sixth in the event, and three of his teammates also finished in the top 10. Edward Little’s Jordan Cummings navigates a red gate setting up her next turn during her second run at the Class A Alpine championships at Mt. Abram in Greenwood. Cummings finished fourth in the event. 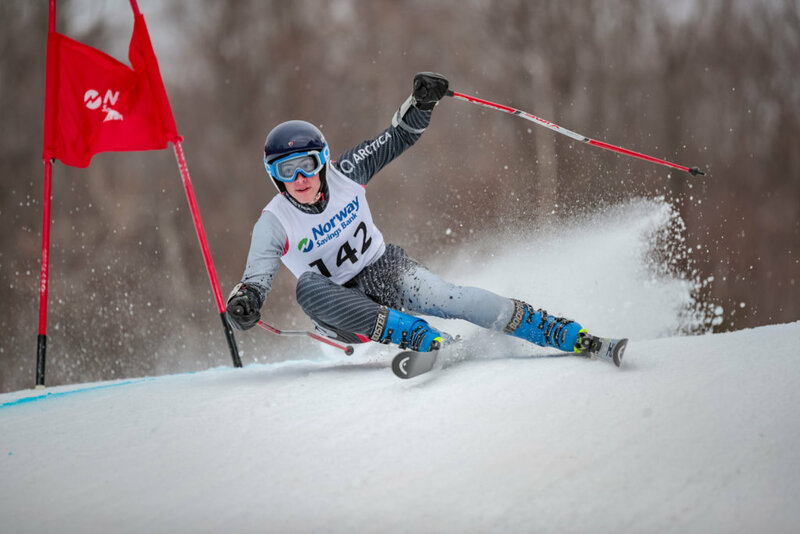 Fryeburg Academy’s Brooke Juneau gets a bit off edge on the lower part of the giant slalom course on her second run at the Class A Alpine championships at Mt. Abram in Greenwood. Juneau finished second in the event. 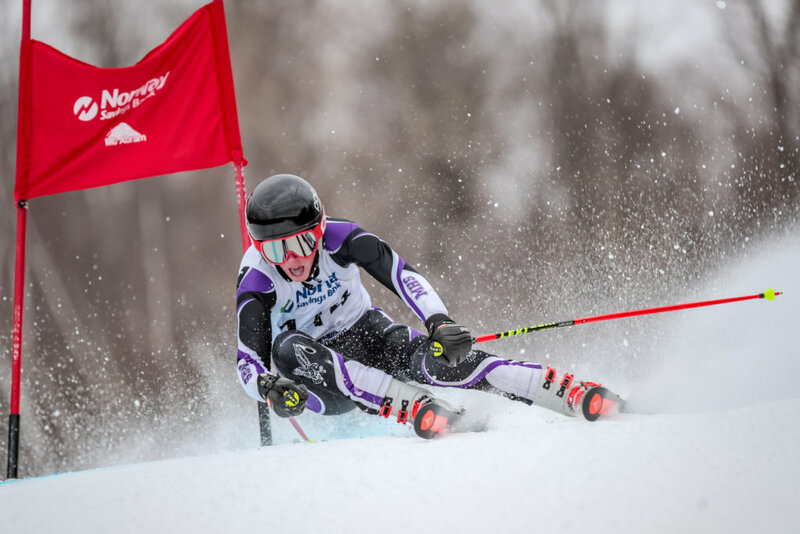 Marshwood’s Sean Maguire gets low to navigate a red gate on the lower part of the course on his first run in the giant slalom at the Class A Alpine championships at Mt. Abram in Greenwood. Maguire finished second by nine one-hundredths of a second. 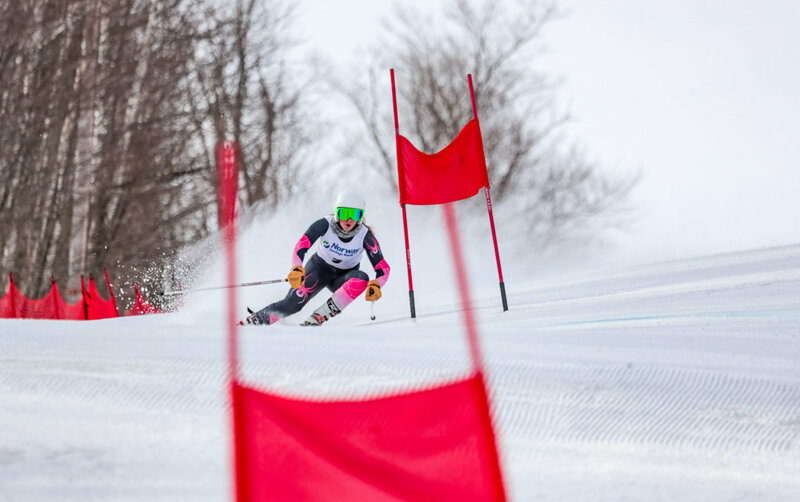 Cheverus’ Annesley Black keeps her eyes ahead as she navigates a red gate mid way through her first run at the Class A Alpine championships at Mt. 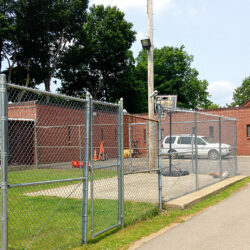 Abram in Greenwood. Black finished first in the giant slalom event.